﻿British Royal Fleet Auxiliary support ship RFA Diligence (A132) recently took a break from her usual role as forward repair ship in order to undertake front line maritime security duties in one of the world’s busiest and most important shipping environments. 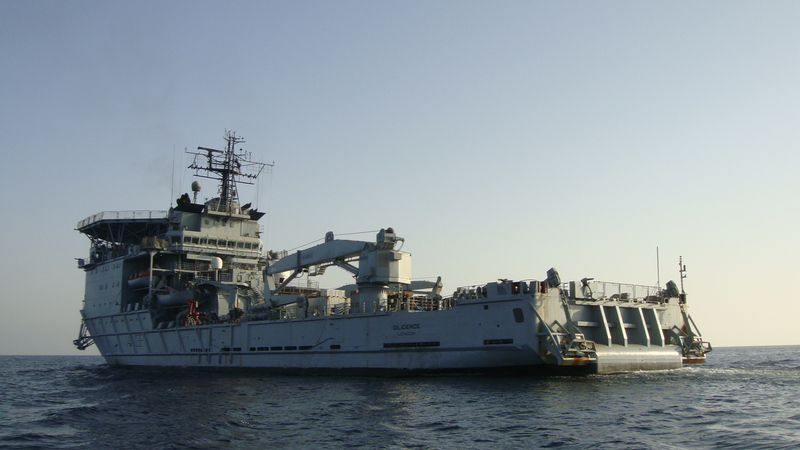 During periods of availability in her normal schedule supporting Royal Navy units in the region, the 10,765-tonne vessel has been assigned to Combined Task Force 150 (CTF 150). CTF 150 is the counter-terrorism and maritime security mission of Combined Maritime Forces (CMF), a global maritime partnership tasked with promoting security and stability in Middle Eastern waters. CTF 150 tasked Diligence with monitoring various vessels of interest and with undertaking ‘pattern of life’ operations. These involve building a complete picture of the maritime environment, such as daily shipping movements and fishing activities, in order to identify behavior that could indicate piracy, smuggling, terrorism or other illegal activities. Diligence also worked closely alongside other warships assigned to CTF 150, including U.S. destroyer USS Winston S. Churchill, Pakistan frigate PNS Khaibar (formerly HMS Arrow) and French frigate FS Commadant Bouan. British Royal Fleet Auxiliary forward repair ship RFA Diligence (A132) pictured at sea in the Middle East, winter 2010. The odd looking appearance of this ship is a testament to her functionality – equipped with a helicopter landing pad on her bridge roof (large enough to support a Chinook helicopter), together with maintenance workshops and a decompression chamber. She can also provide, fuel, water and sullage reception. (Photo: Royal Navy). In training exercises, Diligence acted as a suspect vessel for boarding teams from the other vessels to search. As way of appreciation, each ship offered Diligence the opportunity to ‘cross deck’ enabling RFA personnel to spend time board aboard a foreign warship, sharing experiences with counterparts. CTF-150 was established to help create a lawful and stable maritime environment free from terrorism and related activities. The area of operation spans over two million square miles, covering the Red Sea, Gulf of Aden, Indian Ocean and Gulf of Oman. These waters are a vital artery of world trade that include the main shipping routes from the Far East to Europe and the US with over 23,000 shipping movements per year. In addition the region contains three narrow waterways, known as ‘choke points’, where vessels are required to pass closely between two shorelines. This means they have limited maneuverability and are more vulnerable than would otherwise be the case in open waters. 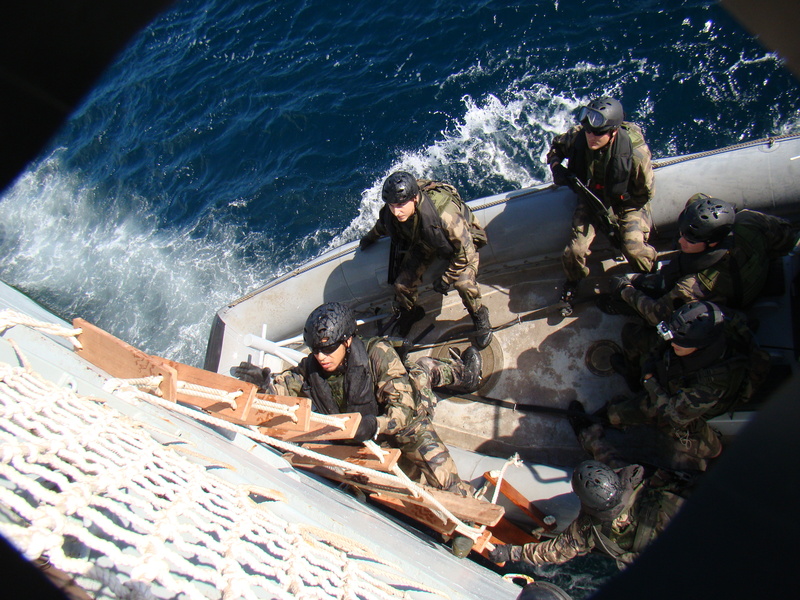 French naval personnel from FS Commadant Bouan practice boarding operations. “As if the geographical size of the Middle East wasn’t a challenge in itself, it is also a busy and constantly changing environment of the very highest strategic importance. Navies work best here when they work together. There is always a requirement for additional ships for coalition operations and I was pleased therefore to be able to contribute RFA Diligence to CTF-150” added Fraser.